Almond flavor is marvelous anyway, but when added to black tea it takes an ordinary blend to the next level. I blended this tea with vanilla black one morning–it was divine. Other blending experiences might include orange blossom black, or coconut black. Matcha Delight is in individually sealed 30 gram cans to retain freshness. 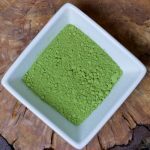 This is a wonderfully sweet Matcha that tastes great all by itself. Lightly spiced and tasting like a good piece of apple pie! No calories in this one though. 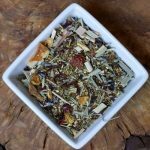 A favorite flavor combination for many tea lovers. This tea is wonderful both hot and iced. This is my favorite assam–it’s consistently fabulous from year to year. It’s bold, yet smooth and has a nice sweet lift on the finish and is wonderful with milk and sugar. Assam is a low grown tea (at sea level) so has the deep red color and robust taste that many black tea lovers crave. Assam is one of the blending teas in English Breakfast tea (the other being Ceylon). This lovely hand-made tea is as beautiful to look at as it is to taste. It has a deep, rich malty taste and natural sweetness that can only come from loving and careful cultivation and processing. I drink this straight up, but its wonderful with milk and sugar. A unique assam from a new clonal, this is true to the assam loveliness of brisk, bold flavor and beautiful deep red color. It’s great on its own or with milk and sugar. I always like mine black, but I never judge. Ava was turning five when she and her mom came into the Studio to create a tea for her party. This wonderful herbal is a combination of Blood Orange Fruit Tea, Green Rooibos, Lemongrass and Lavender. 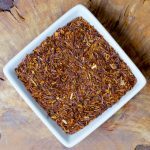 It makes a terrific hot tea for the evening and a spectacular cold-brew iced tea. After offering this for three years now, it’s popularity keeps growing! 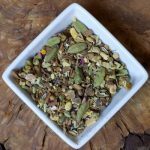 A blend used in Ayurveda, this herbal has so many wonderful ingredients: cinnamon, cardamom, licorice, coriander, fennel, ginger, rose and a small amount of chamomile. It is aromatic and delicious–both hot and cold. 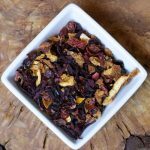 A luscious blend of fruits that brews up for a sweet herbal tea. The flavor is all natural, emanating from apple pieces, hibiscus flowers, cranberries and blueberries. Highly addictive; Please proceed with caution! No caffeine. This traditional Chinese green is known as “Green Snail Spring” because of it’s curly, soft shape. The taste is wonderful–it reminds me of fresh green vegetables cooked with a hint of butter. This is a “competition grade” from the East Mountain of Jiangsu province. Such an enjoyable green! This Black Bi lo chun is one of the richest black teas I’ve ever tasted. The tea leaf is all bud and is oxidized and twisted in to delicate curls. It steeps up bold and full of character–delivering several good steeps. 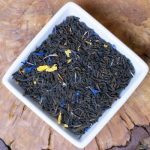 Black tea fans will love getting three flavorful and unique teas each month and there are so many choices your recipient will never get bored. For $21 per month, including shipping, we send three 1-oz. packages of black tea–varying the origin and the blend to keep things interesting. 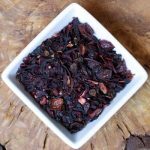 A delicious blend of natural fruits and spices that brews up a mouthwatering cup of herbal tea. Entirely caffeine free, it holds a special appeal for kids and sweet-toothed adults. Yet contains no sugar or other sweeteners. The flavor is all natural, emanating from orange peels, hibiscus flowers, apple pieces, rose hip and safflower. No caffeine. What a fun black tea–a good quality fully oxidized tea with strawberry and rhubarb. This tea is a delight in the morning or mid-afternoon.